Former World Champion Vishy Anand started badly at the Zurich Chess Challenge. In the second round the former World Champion lost with the white pieces to Hikaru Nakamura in a Berlin Ruy Lopez. The top clash between Magnus Carlsen and Levon Aronian was an English game and ended in a draw after 40 moves. Boris Gelfand and Fabiano Caruana drew a Leningrad Dutch after 56 moves. It was already quite a coincidence that in the last eight classical games Vishy Anand and Hikaru Nakamura played against each other, Anand had White. On Friday the two were paired against each other, and again it was the Indian behind the white pieces. And there was another pattern: Nakamura had won the last two games, and again he won as Black this time! In a Berlin Ruy Lopez, Anand repeated his 4.d3 and 5.Bxc6 line which he had also played against Magnus Carlsen in November in Chennai. With 6.h3 he followed his opponent, who had played like that against the French GM Laurent Fressinet last year, and on the next move he played a novelty. It seemed that White had won the opening phase when Nakamura decided to put his king on the queenside. “Objectively I shouldn't even castle long but I felt it was very interesting. I have a feeling it's suspicious to say the least. I kind of just wanted to attack,” said Nakamura. And he got that attack. When White pushed d3-d4 he more or less “forced” Black to sacrifice on h3, as one of the commentators, GM Peter Leko, said. During the game Nakamura was not sure at all whether it was correct, and he was happy to find out after the game that the computer liked it. Anand didn't find the best moves and soon there was no defense against Black's attack. Form is temporary but class, class is permanent. The big game of the round was of course Carlsen-Aronian, a game with a historical average Elo of 2842. The world's #2 equalized rather easily against the world's #1, in fact. “I tried to be a little clever in the opening which was not a good idea because I felt that [after 15 moves] Black is the only one who can be slightly better,” said Carlsen. However, the Norwegian played accurately and managed to keep the balance. Photos © Maria Emelianova. 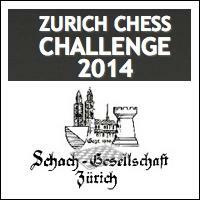 The Zurich Chess Challenge consists of five rounds of classical chess, played from Thursday to Monday (30 January to 3 February), followed by a rapid tournament with reversed colors on the last day (4 February). You can follow the live games here on the official website.